Zoran Poposki is featured in an exhibition at the City Museum of Skopje, as finalist for the Young Visual Artist Award YVAA DENES 09, awarded by the Contemporary Arts Center Skopje in cooperation with the Foundation for a Civil Society in New York. 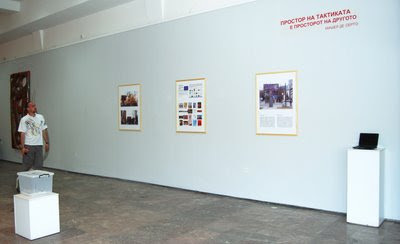 Poposki exhibits documentation of his public art project "Abstract Politics". 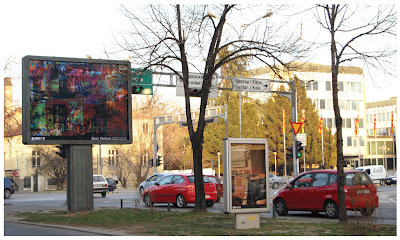 Conceived as a series of abstract prints for billboards installed as megalights on the busiest streets in Skopje, this project aims to reclaim commercially usurped public space for artistic purposes. As space shared by all citizens, public space is where individuals see and are seen by others as they engage in public affairs and is thus a precondition for “public freedom” (Hannah Arendt). The Abstract Politics series of digital prints for billboards draws upon a wide array of artistic strategies traditionally used by abstraction (the liberating power of randomness, chaos, gestures), while at the same time recontextualizing them and translating them into the language of new media. The starting point in the process is the media, i.e. news coverage of national and global political issues. In the contemporary, digital version of the aleatory principle, the headline is searched in Google Images, and the search results thus obtained serve as raw material which is later digitally edited.